The Baron and I recently planned on having dinner out for some Mexican fare. However, The Baron needed to stay close to home and be accessible to a computer at a moment's notice for work. So instead of going out to dinner or getting take out, I made dinner instead. This turned out to be a great dinner, probably better than a restaurant or picking something up! The pork cooked for hours and the only thing we had to do was prep some taco toppings and sides. 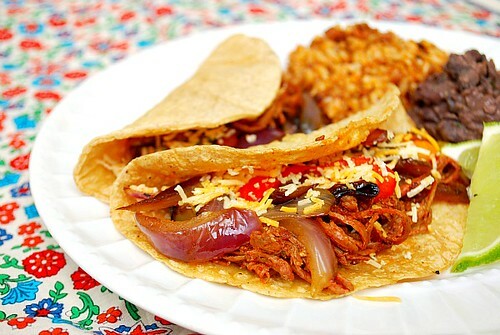 I served the pork in warmed corn tortillas and caramelized onions and bell peppers. Chorizo rice and smashed black beans rounded out the meal perfectly. 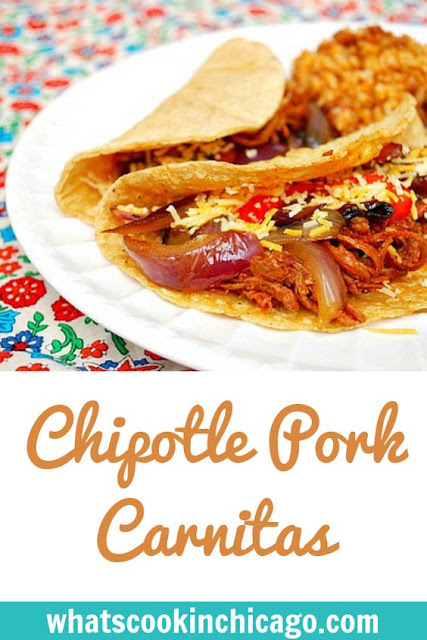 You can use this pork for burritos, quesadillas, enchiladas, etc and because it yields quite a bit, you'll be able to make quite a few things, enjoy leftovers or serve it up to a small army! Rub salt and pepper on pork shoulder/chuck roast. In a dutch oven, heat the oil over medium high heat. Sear the pork shoulder on all sides until it is browned. Remove the meat from the pot and set aside. Add the onions to the same pot and sauté until softened and lightly browned on the edges. Add the garlic and chipotle peppers and stir. Add the tomatoes and liquid, bay leaves, oregano, cumin, cloves, and water. Scrape up the bottom of the pot. Transfer mixture to a slow cooker. Add meat to slow cooker and cook on low for 6-8 hours or on high for 4-6 hours. These sound and look absolutely delicious! I am loving chipotle flavor in everything these days, so good! Made it. UN BEE LEE VA BULL! Ya gotta try it.